“Mumia Abu-Jamal was spared the death penalty in the murder of a Philadelphia police officer on Wednesday. He’ll spend the rest of his life in prison, the Philadelphia district attorney said. But only freedom will satisfy supporters of Abu-Jamal. They call the former Black Panther an innocent, a revolutionary and a celebrated journalist, and Free Mumia will host an event Friday to mark the 30th year of the racially charged case, followed by a fundraiser. On Dec. 9, 1981, Officer Daniel Faulkner stopped a car driven by William Cook, Abu-Jamal’s young brother. Abu-Jamal was in a nearby taxi and ran to the scene. He exchanged gunfire with Faulkner, witnesses said. The officer was hit multiple times and died at a hospital. Three decades later, Seth Williams, Philadelphia’s top prosecutor, agonized over the decision to end the push for the death sentence. He said he remained convinced of Abu-Jamal’s guilt and that he deserved to die. 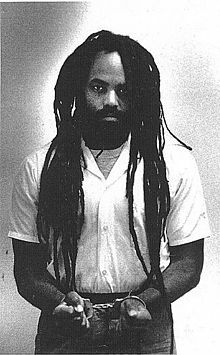 Supporters have steadfastly maintained that Abu-Jamal was framed because of the activist’s criticism and claims of brutality by Philadelphia police. There’s “strong and concealed evidence of his innocence,” says supporter Johanna Fernandez, a professor at a New York college.